When looking through my Fruits Basket's scans, credit goes to APA for the scan- thanks Nuriko, this beautiful picture of Tohru really had potential (not sure I acheived it but I had a really good try). I have recoloured, de-noised and manipulated nearly but not quite every pixel of Tohru (a LOT of work and time). Comments are always appreciated and please enjoy my latest wall. She's so pretty ! Well done ! I like it, keep up the good works ! EEP so much work.. *twitch* many hours I can tell! heehee Good JOb! great job tishdon! tohru looks so cute! 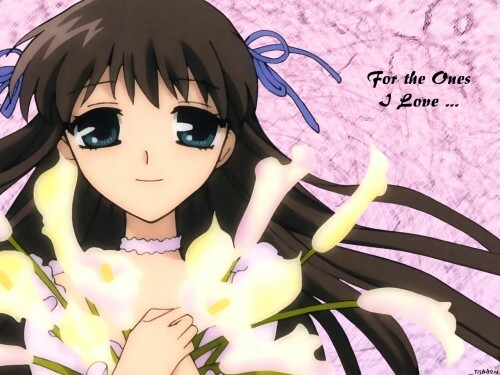 i especially like the lilies she's holding... pretty! keep up the good work!